A public lecture by Dr Kimberley Czajkowski, Lecturer in Ancient History, University of Edinburgh and UWA Institute of Advanced Studies Visiting Fellow. The Roman Empire was “an empire of laws”. Or was it? If it was, whose laws and what would the functions of such laws be? The Roman imperial project had a long afterlife in the language and legal cultures of later empires, still felt in the 20th century. As such, it has long been studied systematically as a unified legal system. Recent work has called this assumption into question, and emphasized the pluralistic, multifaceted and even constructed nature of Roman law in the earlier period. The centrally based imperial ideology, in which Rome’s law was a “civilizing” force on her subjects, did not necessarily reflect the everyday reality of indigenous populations in the vast areas subject to Roman rule, with their multiple histories and cultures. 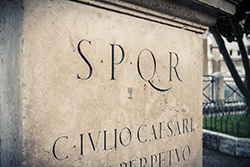 This lecture will consider the ramifications of the Roman “empire on the cheap” model for the construction and practice of law, and the role of indigenous communities in this process: this skeletal structure gave imperial subjects the opportunity to “write back” and assert their own understandings of law and empire. This in turn has implications for how we should understand the relationship between rulers and ruled, and the way that law is both imagined and used on the peripheries of the Roman world. Dr Kimberley Czajkowski is a Lecturer in Ancient History at the University of Edinburgh. She was previously a Postdoctoral Research Fellow at the Cluster of Excellence 'Religion and Politics', Westfälische Wilhelms-Universität Münster, Germany. She is trained across disciplines in Classics, Jewish Studies and Ancient History, and received her doctorate in Ancient History from the University of Oxford in 2015. Dr Czajkowski’s work concentrates on the history of the Roman Near East, and the impact of empire on this region. She has a particular interest in its legal culture and the interaction between local and Roman legal traditions, the former including Jewish law. She employs modern socio-legal approaches in order to try to understand how people “on the ground” found out about, used and manipulated the legal instruments available to them, and how this should influence our own understanding of the nature of law in the Roman empire in the early and high imperial periods: her first book, Localized Law: The Babatha and Salome Komaise Archives (OUP 2017), applied this in a detailed case study of one village community in the newly annexed province of Roman Arabia, focussing particularly on the experience of particular Judaean inhabitant of the area. Her work thus crosses the traditional subject boundaries to deal with concerns pertinent to Ancient History, Law and Jewish Studies.